The optimal method of intraabdominal access during laparoscopic surgery is still being debated. Access with optical trocars has been demonstrated to be faster, associated with a lower incidence of wound infections, trocar hernias and smaller incisions but rare injuries to bowel, blood vessels, liver and omentum have also been reported. Our objective was to review our experience with the use of optical trocar entry and compare it with the open technique. A retrospective chart review of one surgeon’s experience for establishing peritoneal access during laparoscopic surgery was performed for the period from April 2007 to August 2010. Totally extraperitoneal laparoscopic inguinal hernia repairs and single incision laparoscopic procedures were excluded. Peritoneal access was obtained by an open (Hassan) or closed (5mm bladeless Optiview trocar) technique. Patient age, gender, BMI, prior abdominal surgeries, location of trocar entry, and complications of access technique were recorded and compared between the two techniques. Student’s t-test or chi square were used for comparison; p<0.05 was considered significant. 728 laparoscopic procedures were included in the study. The Optiview technique was used in 380 (52.2%) cases; its use increased from 18.5% of the cases in 2007 to 71% in 2010 (p<0.01). Patient age was 49.5±14.3 years, 112 (29.5%) patients were men and BMI was 35.4± 9.2 kg/m². 154 (40.4%) of patients had previous abdominal surgeries. None of these baseline characteristics were different between the Optiview and Hassan techniques. Location of Optiview insertion was the right upper quadrant (n=162, 42.6%) the left upper quadrant (n=101, 26.6%), left lower quadrant (n=52, 13.7%), periumbilical (n=39, 10.3%) and right lower quadrant (n=26, 6.8%). There were no vascular injuries, no wound infections and no trocar site hernias noted. One small bowel enterotomy and four superficial liver lacerations were caused during entry without any further consequences for the patients. The open technique was associated with 3 wound infections and 1 trocar site hernia. No differences in the number of complications were noted between the groups. 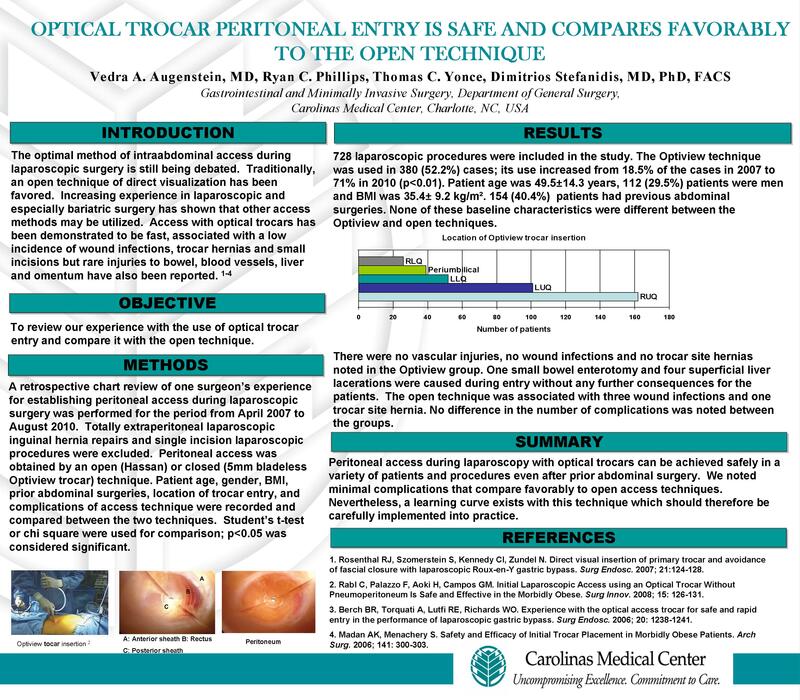 Peritoneal access during laparoscopy with optical trocars can be achieved safely in a variety of patients and procedures even after prior abdominal surgery with minimal complications that compare favorably to open access techniques. Nevertheless, a learning curve exists with this technique which should therefore be implemented carefully into practice.